Ambassador Saadi Salama attends and delivers a speech at the international workshop on " Identification of people's solidarity for peace, security and sustainable development"
Home The Embassy Activities Ambassador Saadi Salama attends and delivers a speech at the international workshop on " Identification of people's solidarity for peace, security and sustainable development"
On May 21-22, 2018, Ambassador Saadi Salama attended the international workshop on " Identification of people's solidarity for peace, security and sustainable development" organized by the Vietnam Peace and Development Foundation, Rosa Luxemburg Stiftung in cooperation with Quang Tri Provincial People's Committee. Today, weare gathering here in Quang Tri Province which marked a shiningpage in Vietnam’s history, written by the noble sacrifices of sons and daughters of a steel-like land, and of young people who “left aside pens and inktrays” to follow the call of the Homeland and devoted their prime time to “Easter Offensives”. Together with other sections of the Vietnamese people, they contributed their share to the victory of the Spring Time General Offensive 43 years ago, liberating and reunifying the countryon 30 April 1975. Our meeting today is organized while the world is witnessing bis changes, which urge people to strengthen solidarity and action to overcome together challenges for common goals. Solidarity provide fresh impetus for countries from all over the world to protect their nation’s rights. Solidarity is even more important in the countries in Middle East in general and Arab states in particular as the region is still experiencing conflicts and unstability, because it is the indispensible and only way to deal with factors threatening peace and security in the region. The lack of solidarity, consensus and mutual sharing has helped hostile forces and their allies to carry out their plans in their own interest in the region and to dominate nations in the region, control the resources, threaten security, depriving their sovereignty and independent right of those countries. This requires us to ignoreminor conflicts or and divergencesto join hands for a common goal and create synergies. Such mutual sharings will unite people from different countries in the region and create necessary and stable bases for cooperation and action together to reach common goals. This will bring about benefits in politics, security, economy, culture, society… not only to all related countries but also all people in Middle East. However, these goals are facing various challenges. The long-term occupation has refused basic rights of Palestinian people, of depriviation of Palestinian territory has been going against UN Resolutions and Israel‘s international commitments; other interventions to many Arab states through wars, conflicts which have threatened security, stability and peace in the region. Moreover, there are threats of terrorism in different forms and several plans to control Middle East by some forces. In such current concerning situation, the building and consolidation of solidarity among countries, especially in the region, are indispensable ways to solve every newly-emerging issues. The solidarity among peoples in the region nowadays is even more important in the context of current internal conflicts. Therefore, solidarity will create synergies for the struggles. Enhancing the role of solidarity will also bring about benefits to all nations. Yet it will be successful only when countries carry out coherent economic development strategies with coordination among various fields. 1. In order to build solidarity, we need to work out a just solution for conflicts in the region. Among them is the Palestine -Israeli conflicts which has lasted 70 years and considered a main cause of conflicts in the Middle East. All resolution must be based on international law, guaranteeing fundamental goals of establishing a Palestinian State in Palestine, which was occupied in 1967, and its capital East Jerusalem recognized by UN and international community. 2. Solidarity is collective and comprehensive mobilization against violence, terrorism and inequality. Cooperation is not only killing terrorists, their supporters, their sponsors, but also widening this cooperation to eradicate terrorism and dealing with thinking, social and economic causes. Moreover, eradicating these factors will strengthen solidarity among communities in a country, and among countries in the region. 3. Enhancing the role of state diplomacy and people-to-people diplomacy to reinforce principle of settling conflicts by peaceful means, to promote mutual understanding among nations. supports from people worldwide will takle difficult issues in the region based on respecting legitimate aspiration of countries in the Middle East. 5. Promoting economic cooperation among countries in the region, via bilateral trade, investment, and joint venture. These activities will help develop the economy of poorer countries, contributing to solve social issues which may cause unstability. Economy connectivity is also a necessity of globalization, and increasing regional link will promote friendship among countries. 6. Building democratic societies based on the principle of equality, where all citizens have to obey laws and respect fundamental political, economic and social human rights, transfering power peacefully by transparent elections. 7. Intensifying struggles against poverty, reducing unemployment and protecting the environment to guarantee inclusive and sustainable development goals. It requiresunanimity in international forums based on principles of cooperations and sharings. 8. Deepening cultural relations among countries because culture will bring countries closer, enhance connections and deal with cultural hegemonism in the context that some countries are imposing their lifestyle and values on others countries in the region. These folk-verses show that Vietnamese people, from generation to generation, havealways reminded each other of the importance of love, protection, sharing and solidarity.This is a precious tradition, a source of power to help the Vietnamese people to gain brilliant victories in the wars against foreign invasion throughout the history. When being still alive, President Ho Chi Minh considered the combination between national unity and international solidaritya vitality for to every victory of Vietnamese revolution. "When Vietnamese people unite in one, our country is independent and free. Otherwise, the country will be invaded” the preeminent Leader of Vietnamese people said. The fact was shownthat struggles of the peoples in the world have affirmed that solidarityand unity will create power, as President Ho Chi Minh said "Unity, unity, great unity! Success, success, great success!" Once again, I would like to express our honour to attend this meaningfulevent. 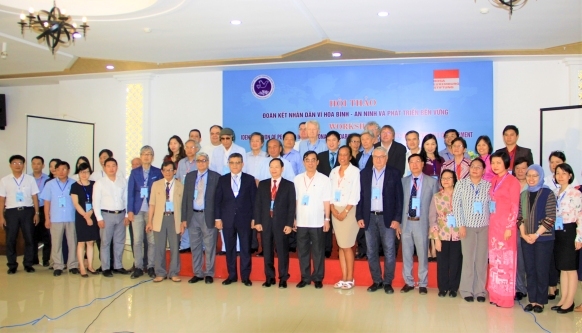 I would like to sincerely thank and highly appriciate the Vietnam Peace and Development Foundation and especially Madam Nguyen Thi Binh, Former Vice- President of Vietnam, a close friend of Palestinian people in particular and people in Middle East in general. Finally, I would like to wish our workshop splendid success.